We just learned that The Universe Builders: Bernie and the Putty won a Gold Medal in the Readers’ Favorite Book Contest. The book was entered in the Fantasy Category. 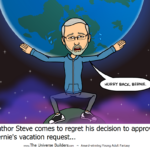 The Universe Builders: Bernie and the Putty by Steve LeBel is an epic science fiction novel about creation, and a race of shimmering gods that use something called universe putty to help mold worlds, and such. Get it? Kind of like Silly Putty, but on steroids. The story begins with Bernie, growing up in the shadow of his father, Simeon, one of the most renowned universe builders with three best universe awards. After his parents divorce, his father abandons Bernie and his mother. Forced to live in poverty, Bernie grows up with minimal friends. Billy is the bully that plagues Bernie his whole life, especially after Bernie came to his friend Suzie’s rescue. After Bernie graduates from school with a universe building degree, he applies for a builder’s job, and lands a probationary position with The Business. As an average student the odds are against Bernie from the start, especially when he finds out that his nemesis, Billy, is in the cubicle next to his. Billy’s uncle is the boss. Bernie is given a trial project of building a universe and if he passes, he gets a permanent position. Billy is out for revenge from day one, and sets out to sabotage any chances Bernie has. Steve LeBel does a magnificent job of creating a race of gods that are, above all else, human, except for being immortal creators that is. Steve’s writing style pulls you into the story with a sense of humor that often occurs in the last line of a chapter. You simply cannot help laughing out loud, while turning the page to start the next chapter. Although this is an epic sci-fi novel, it is a marvelous story that will touch you in more ways than you would ever expect. The Universe Builders is smart, witty, creative, and captivating like nothing I have ever read before. Almost impossible to put down. Awesome!